The Middle East has been consistently in the news for decades now. Refugees continue to flee the war torn countries of the region. We've learned how to pronounce the names of the countries but what do we really know of the people who live in there? 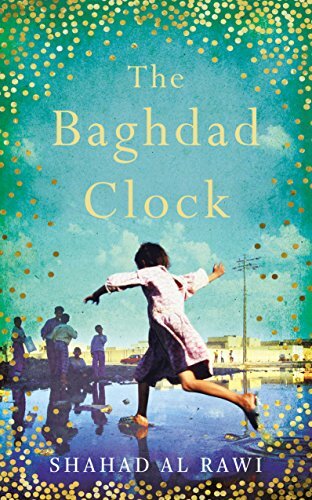 Shahad al Rawi's novel, The Baghdad Clock, takes readers into one Baghdad neighborhood from 1991 at the beginning of the first Gulf War through two young girls' growing up and becoming woman all the way to the present day. The unnamed narrator meets her friend Nadia one evening when they are in the neighborhood air raid shelter with their mothers. The two of them become inseparable and continue to go to school, play, and explore even in the shadow of the war raining down on their country. They grow, they fall in love with boys, and they watch as long time neighbors slowly emigrate to find safety and security away from the Iraq of bombs and economic sanctions. The novel is a look at everyday life in Baghdad, a chronicle of a neighborhood slowly losing its sense of community, and an account of two friends coming of age and trying to preserve the memories of the people and events of their youth. There is no real unifying plot other than the changing of the neighborhood and the narrator's musings on it and the people she knows. Aspects of magical realism are threaded through the narrative with the narrator being able to share Nadia's dreams, with the neighborhood portrayed as a ship, and in the person of an old soothsayer who appears in the neighborhood in various guises throughout the novel to predict the future and to warn the inhabitants. The tales of the individual neighbors makes them fully rounded, real characters and it clearly diminishes the neighborhood as each of them eventually climbs into the cars that whisk them away to another life. This particular neighborhood in Baghdad is very obviously meant to mirror the disintegration of Iraqi society as a whole as the wars go on and different sorts of people, never described and never joining the fabric of the existing place, move into the abandoned homes. The daily tragedy of war is very evident, especially in the short history of the neighborhood the girls write, even if they aren't chronicling deaths but rather defections and disappearances. The story was slow, perhaps because it was fairly directionless, and the use of the Book of the Future, set in the present (or near enough) and then moving into future predictions at the end was at odds with the tone of the previous 3/4 of the novel. The writing was sometimes a bit confusing, whether as a result of this being a translation or simply transferred from the original it's hard to say. It does offer a perspective on daily life in Iraq that those of us in the West rarely see and as such will be of interest to those curious about this part of the world. Thanks to LibraryThing Early Reviewers and the publisher for sending me a copy of the book to review.